It’s that time of year again where I’m getting more info as to where music created under my hands has been out in the wild in the last quarter. Meaning I’ve got another list of television shows where you’ve heard my creations. My request is for you to comment and let me know if you’re watching any of these shows. Reveal which ones are on your have to watch television list. What a list eh? More new shows. More episodes of Veronica Mars. Speaking of which I was interviewed on a Veronica Mars podcast this morning. A fun interview and one that I hope I’ll have a link to share with you soon. Heidi had some great questions and we covered other television shows I’ve had music on. Plus she is linking another song you’ve hopefully heard at the end of the interview. If you’re a fan of any of these shows. I’m going to ask you to please sign up on my email list. Find out when I get more music on television shows and get into more of my music that is specifically my artist side. You’ll enjoy it, I know it. I don’t often work on doing cover songs. There’s a bit of a foreign concept to me. Mostly due to me not learning a lot of songs when I started playing music. However, once in a while I do find a song where I’ll actually learn it and do a version of it. 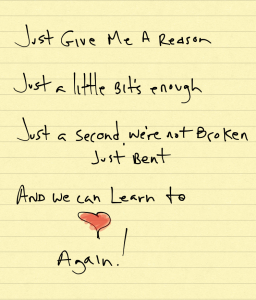 Such is the case with a recent P!nk tune known as Just Give Me A Reason. I’ve worked up a version with a new signing friend Kristy Hanson. She’s actually tackling P!nk’s part, while I’m putting the music and the duet vocal part of Nate Ruess. I’m happy with the way it’s turning out. I should be done with the mix tonight. I’ll likely be shooting some video for this and making it one of the pledge rewards for those who are interested in being a part of my PledgeMusic campaign coming on July 8th. In the meantime, enjoy your day. Don’t be broken! Thanks P!nk for another great song. At some point I’m gonna want to co-write one with you. That’s right, I’m throwing the gauntlet down and saying I want to write a hit duet with you as well. Happy Monday morning. Today’s little journey is going to be about remixes. 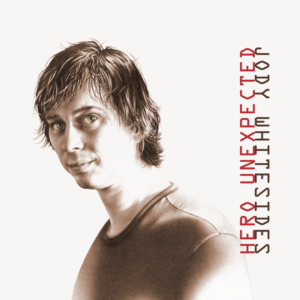 When I did a song called Hero Unexpected I made a decision to seek out a few friends to do some remixes of the song. It didn’t hurt that so many people really dug the song. One of the remixes was by a friend who would come to my game nights, Chris Carter. No, not the Chris Carter that penned the X-Files. Chris ‘Von Pimpenstein’ Carter, as he’s known to go by. A master music mixer. It’s those game nights that bring us to this hanging with a hero for music monday. Rather this version of Hero Unexpected. When you click on the audio button below, you’ll hear the version of my song that Chris came up with in-between our hanging out and playing games. It’s a darker, more urban embodiment that I never dreamed of. He actually came up with something super unique on it. I love that. Part of the whole reason I wanted to have remixes done. If haven’t heard the original then I’d say hit the Hero Unexpected music page and listen to the audio clip there. Notice how night and day different Chris’ take on the song is. I have a wonderment about his audio wizardry and twisting my vocal into a new melodic value. That’s what caught me most off guard about his remix when I first heard it. If you’re enjoying it as much as I do, I implore you to purchase the song at your favorite digital service. I also ask for you to sign up on my email list and keep abreast of new musical developments from me. We’ll both be happier for it. Since those nights, Chris has moved to the east coast so there hasn’t been any hanging out together. We do stay in touch via email, phone and such. At some point we’ll get a chance for hanging out and/or work together again. If not for my music and his mixing talents, then most certainly for my pizza making skills. He loves my pizza. In case you’ve been around my spot of the web before, today you’ll notice a bit of a change. Yes, there’s a little bit of a change in the air. 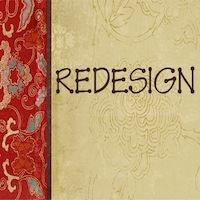 Think of it as a rebranding or more like a redesigning the look and feel of my digital home. A couple of motivating factors led to this update. First and foremost in redesigning the look was a desire to have a site that works well with the responsive design of the programmer’s theme. The old version held some of it’s responsiveness, but I had made so many tweaks to the CSS that it had a tendency to fall apart when it hit the phone screen. Thus I had turned it off – meaning browsing on a phone had you zooming in and out. So 2012. Now the site flows well from 30″ computer monitors, right on down to phone screens. That’s a big plus. The second factor for redesigning the look was a desire to make better use of images as part of the navigational aspect of the site. I love sites that keep things simple. Certainly what I’ve attempted to do here, but with a growing catalog of material, it needed a spiffier interface. My theme has the capability and I’m making better use of it. Which is why you’re now seeing more images. Plus on specific pages, I’m focusing more on that content rather than a kitchen sink of everything. Another recent update is the addition of limited liner notes on my lyric pages. Some more surprises are in store so bookmark me and come on back soon. Better yet, sign up to get on my email list and get a strong heads up as to when I have anything new and fun to write up about, especially the music! Take a poke around, enjoy my redesigning the look and feel of the site. Tell a friend and share. I remember that when I purchased the “Songs About Jane” CD by Maroon 5, it was the first CD I had bought in a few months. Mostly because I wasn’t finding a whole lot of good music at that time. In walks Maroon 5 and I latched on to this CD in a big way. One of my favorite songs from the disc is Sunday Morning. The girl I was dating at the time loved to hear me sing this song when it played. I really dig the melody of the tune and the pictures it creates in the mind of lazing around on a Sunday. I’ve recently finished writing a song with the lovely and formidable Manda Mosher. It’s our first foray into doing a co-write and I’m hoping it leads to many more. She’s a pleasure to write with. 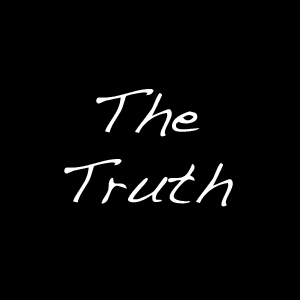 I’m here to give you a sneak peek at The Truth lyrics which is the title of the song we penned. We’ve got a demo recorded and I’m sure we’ll be sprucing it up before too long to present to the world in fully finished form. In the meantime make sure you follow her band Calico on twitter or Facebook. On that note, do the same for me Twitter <– follow Facebook <– follow. If for no other reason that to stay up on other sneak peeks either of us may be unleashing into the world. Why would you want to be the last to know? Be the first, it’s so much better! You know, I remember this as a kid. I really liked this song and I have no real idea why. It’s Heart and Soul by T’Pau. These are the lyrics and I’ve linked the video too. Moving forward with the digital age a vital part of the recording process got lost along the way. The part was the whole thing with who did what. Sadly it’s likely the easiest thing to add and it got left behind. There is now a strong push by NARAS a.k.a. Grammys to bring this into the future. Yes, adding liner notes is getting a nice lift to go digital. I took some time yesterday to go through all my music and lyric pages to update them with some simple liner note information. Thus now you can learn who wrote what, who played what, who mixed what, and who mastered what on all my released recordings. Beyond the simple liner notes I added a couple of extra bits of information for fun. The extra bits are also to answer some of the questions I’ve been asked about particular songs. As the actual standard for liner note information gets finalized, I’ll likely add additional bits of information to keep it current. Right now there is no standard, thus it’s what I currently imagine it to be. For future recordings my liner notes will get much more detailed. Detailed to the point of geekdom. Which means I will include things like what guitar I used. What kind of strings, pickups, etc. Same with vocal mics, DAW, drums, bass, synths, etc. Essentially I may include the whole darn shebang into the liner notes. Plus I’ll add thank you’s and other acknowledgements. Much like you would see on printed materials that used to accompany Vinyl and CDs. Of course they’ll likely get split between liner notes that are specific to a song, and those that are general to the release. Details, details, details. All to satisfy the ubër fan and of course myself. I love to read about the who, the what, the where and the when of recordings. Head on over to the music pages and delve a little further if you dare!